Same as the FX799T transmitters, but with a 90 degree vertical SMA connector. Also available FX668T VTX with Pit Mode. It seems most people are running FXT FPV transmitters on their racings quads at the moment, and no wonder why, we can’t fault them. They are super compact, lightweight, easy to use and feature packed. Competition quads are getting increasingly smaller, but even where space is at a premium, you should be able to fit in one of the FXT FPV transmitters, they aren’t much bigger than a pound coin. They are also easy to use thanks to their push channel/band selection button. As there’s not a fiddly dipswitch in sight, you’ll be able to flick between channels in seconds, which is really useful at race meets. What’s more, as they support a full range of channels, including RaceBand, you’ll always have the option to change to a different channel if interference becomes a problem. 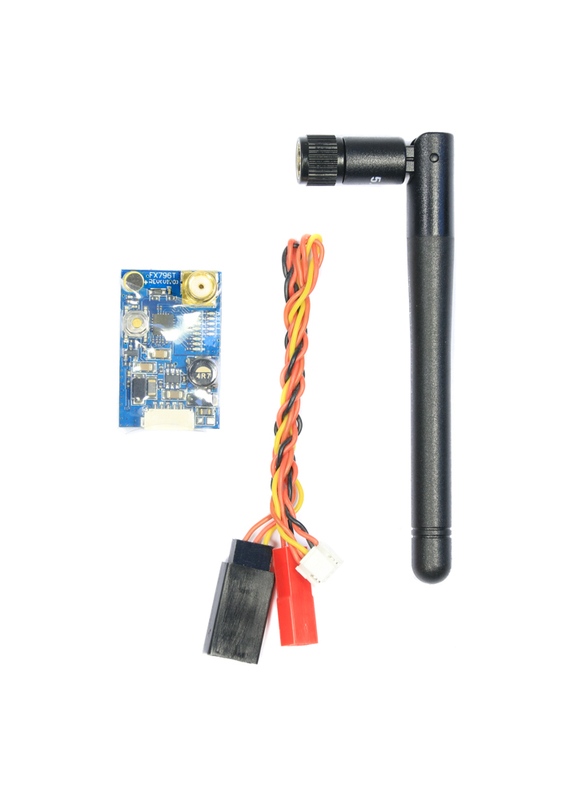 Wiring couldn't be easier, they are directly compatible with 3-4S LiPO and feature a handy 5volt regulator for powering a FPV camera, so no regulator required. Furthermore it utilises a locking cable, so there's no chance of it coming out of place in flight. Last but not least in terms of features, they also have an onboard microphone. This might sound like a pointless feature to many, but there are benefits to be had from being able to hear what the motors are doing (check out this blog post), indeed some of the top racers are using mics to go even faster. Most importantly they are popular because they have proven reliable. 25mW FX796T: This is a UK legal transmitter, it’s 25mW power output and 27 channels are free to use in the UK without a license. Although you have probably seen more powerful FPV transmitters, don't think it has a poor range because of its low power rating. With the stock antenna you can get 200m in open space. However, if you are using some circular polarised antennas, you can easily get >300m. Low power FPV transmitters are also really good for indoor environments, where high-powered transmitter often cause multipathing (poor signal quality caused by the signal being reflected by obstacles). 200mW FX796T: 200mW is a power output used by a lot of FPV mini quad racers. It's enough to provide a decent range and reception and equally won't kibosh everyone else’s fun, or eat into your battery life. 600mW FX796T: This transmitter certainly packs the power; 600mW is enough for 1km+ LOS long-range flights. All of the transmitters operate across multiple frequencies and channel bands, including the newer 'RaceBand', making them compatible with most FPV gear on the market. Best still, there’s not a dipswitch in sight, it has a channel selection button and LED light display that makes changing channels a painless experience. The RED LED indicates the Channel frequency selection, the Blue LED indicates the Band selection. All of the models come with a dipole antenna, but we recommend using the Skyzone circular polarised FPV antenna for better recption and increased range.